These are some of the folks Jan will visit during the 2011 Farmlandia road trip. These featured farmers and ranchers have agreed not only to tell their own stories, but also to be our guides to their neighbors, to their communities, and to the issues both unique to their region and relevant to us all. Please check back as I add more profiles. 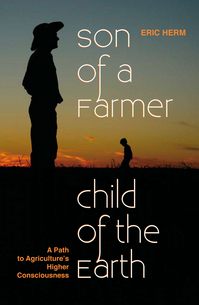 Farmer, author, activist Eric Herm was raised on a cotton farm near Ackerly, Texas. After college, travel, and a stint as a broadcast journalist, he decided to return home to farm with his dad on land that has been in the family for almost 100 years. At first he thought planting genetically altered cotton seed, with all of its advertising of high yields and an easier way to farm, would be the perfect solution to the farm's high fuel and labor expenses. It made sense short-term, but he was unaware of the other problems it might create later on. "I talked my father into planting more than 1,000 acres of Monsanto's Roundup Ready cotton....I had no idea what I was doing to the ecosystem." It didn't take long for Eric to doubt the wisdom of GMO seeds and the use of Roundup Ready weed killing chemicals. "Away from farming, I had refused to use chemicals in my own home or on my lawn, but strangely on the farm it was acceptable." He then set about making changes of his own to reverse the damage done to the soil and to restore it to health. Eric's first book was published in 2010 and he is at work on the next one. As of this writing, he and his family and the entire region are still in the midst of one of the worst droughts in Texas history. As a result, there will be no cotton harvested this year. Mike grew up in Evergreen, Colorado, and with a degree in animal science and a passion for raising cattle, started ranching in the 70s. When he saw how small to medium-sized livestock producers like himself were getting squeezed out of the market by the giant meatpackers, he started fighting back. Advocating for fair prices and a competitive market, he spoke out against the predatory, monopolistic business practices of the "big four" packers who control over 80% of the American beef market. In 1996, Mike and nine other ranchers filed a class action suit in federal court against IBP (now Tyson), charging them with violating the Packers and Stockyards Act (GIPSA) which forbids "unjust, unfair or discriminatory practices" against livestock sellers. The packers retaliated by boycotting Mike's feedlot and putting him out of business—almost. Mike hit back by starting his own direct beef-marketing business that today processes beef for other producers and their customers, sells his own beef through his retail outlet, and buys calves from other small ranchers who raise the animals under his protocols. They now raise and process free range chickens and pigs. Mike continues to be an outspoken advocate for ranchers and farmers, and to fight against the power of Big Ag and its collusion with government, big business, and big farm organizations, to transform once-proud independent farmers and ranchers into "indentured slaves for their agribusiness bosses." Dave was working at the labor department in Washington, DC, when he got a frantic call from his sister in Iowa. A Minnesota corporation was about to build a concentrated animal feeding operation (CAFO) that would confine 5,000 pigs indoors less than a mile from their farm, so close she was terrified that her children's health would be threatened, especially the two boys who had severe asthma. To make matters worse, the CAFO was to be located on an environmentally sensitive watershed. The operation had received a permit from the state; neither local officials nor the nearby neighbors and community had any say in the matter. Dave went back home to see what he could do to help. Infuriated by what he found there, he stayed, this time as a vocal advocate for reform of agricultural policy, politics, and an endangered food system. Dave, along with fellow activists, started Food Democracy Now!, a grassroots movement that includes farmers, writers, chefs, eaters and policy advocates who "recognize the profound sense of urgency in creating a new food system that is capable of meeting the changing needs of American society as it relates to food, health, animal welfare and the environment." Today, some 250,000 farmers and citizens—urban and rural—have joined Food Democracy Now! campaigns by signing petitions and writing letters to state legislatures and policymakers in DC to challenge corporate control of our food system and to advocate for a more just and sustainable food system. Richard farms land in northwest Missouri that has been in his family for five generations. With his son Brandon, he grows seed soybeans, food corn, and cattle. His column for the Daily Yonder, "Letters from Langdon," provides both commentary on rural issues and a rare view of daily life as a farmer. He is the current president of the Missouri Farmers Union. As of this writing, Richard and his wife and family are heading to high ground, forced from their home and land by the worst flooding in Missouri history. The farm, and the flourishing crops, will be inundated. ...here I am at the peak growing season waiting for millions of gallons of water to cover my crops. Instead of being eaten by hungry people, the food corn I grow will be consumed by the river. Customers will have to buy their soybean seed somewhere else next year. The water will have ours. Read the entire article, "My Forced Summer Vacation"
Francis and his wife milk 80 cows on their organic dairy farm outside of Fairfield, Iowa. His background is unique, having graduated from college with a degree in music and philosophy, earning a Ph.D. in soil science, doing a stint as a soils specialist with the USDA Extension Service in Washington, DC, and serving for two years as a Fellow of the W.K. Kellogg Foundation Food and Society Policy Fellows program, where he honed his skills in writing and speaking on issues related to food policy. His book, A New Vision for Iowa Food and Agriculture, was published as he began his run for the office of Iowa Secretary of Agriculture in 2010. He writes passionately, and with the credibility of a scientist/farmer/policy expert, about what sustainable agriculture for the 21st Century is and should be. An outspoken critic of corporate-controlled, industrialized agriculture, he recognizes that change will not happen overnight: "The important thing is to recognize the need to change, then begin the process of change in a direction that positions us for the future." Perhaps commercial farming, as designed, must die in order for Nature and humanity to fully recover and real farming to begin anew. We're trying to develop a local food system that supports farmers and ranchers and provides healthy, natural food to consumers. If you want to change the ballgame, you have to address the policies that are responsible for the system we have in place. If you change policy, the market will change. Agriculture needs diversity-both in what it grows and how it markets. We work with nature, there's no way we can escape it. We can't put a dome over the earth; we must live with what we have, and not destroy it in the process. Because the term "sustainable agriculture" has been co-opted by agribusiness, I find the term "ecological agriculture" more useful for describing the antithesis of industrial agriculture.